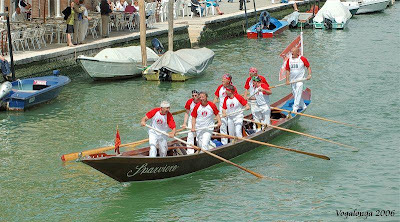 Here are two images taken from the Tre Archi Bridge during the 2006 Vogalonga. I believe the boat in the foreground is a batela, one of the club boats from the Remiera Francescana. Vittorio Orio is the founder and president of the club, and in fact he is rowing as the poppier in these shots. What makes this remiera unique is that it's a club associated with the Franciscan Order of the Catholic Church. In this photo, the rowers are raising three of the remi to make a symbol that is quite appropriate for a rowing club within the Franciscan Order. If you look closely, you can also see a big smile on Vittorio's face. Hi Greg, great post indeed! 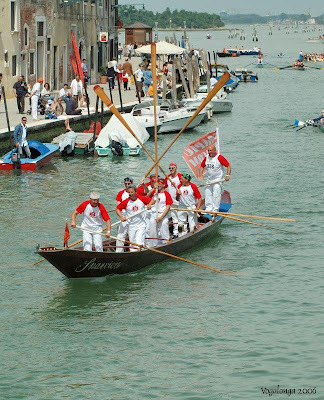 I just called Vittorio and he said me the boat is a (quite rare) pupparin with eight oars. I thought it resembled a pupparin, but I'd never seen one so large. Quite a rare boat indeed!